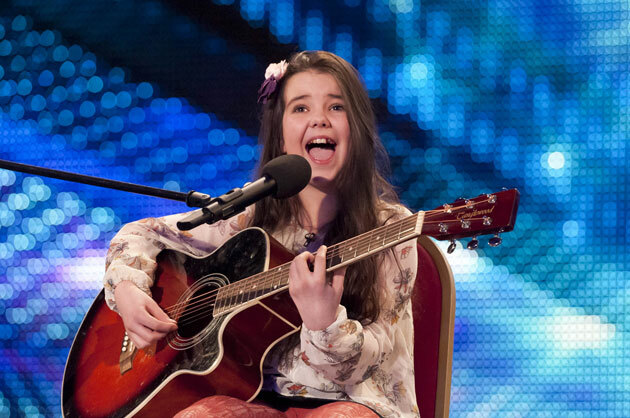 Britain’s Got Talent 2012 continues tonight with week 5 of the auditions. On tonight’s show, we’ll see 15 acts perform in front of the show’s judging panel of Simon Cowell, David Walliams, Alesha Dixon, Amanda Holden and guest judge Carmen Electra. 12-year-old Lauren Thalia wows the panel with an acoustic version of Turn My Swag. But will she get the three yeses she needs to make it through to the next round? Also on tonight’s show is a French stunt group called Cascade. The group describe their act as a mix between “martial arts” and “human stunts”. There’s a Ballroom dancing couple. 16-year-old Kai Widdrington and 15-year-old Natalia Jeved met when they were introduced by their dance teacher. Boy band The Lovable Rogues take to the stage in the quest for 3 yeses. The trio – Eddie Brett, Sonny Jay and Té Eugene – perform their own original track. And there’s impressions and a range of comedy from 38-year-old Marea Smithson.